Recover an Elder Scroll to learn an Ancient Secret. Accept the task from Paarthurnax. (Optional) Talk to Esbern or Arngeir. Read through the rare books provided by Urag gro-Shub. Receive the necessary items from Septimus Signus. Locate the ancient Dwemer city of Blackreach. Alduin's Wall documents how the ancient Nords of the First Era used a special shout to help them dispose of Alduin. Your search for this particular shout takes you to High Hrothgar and eventually to the leader of the Greybeards, the dragon Paarthurnax. He reveals that the Throat of the World was indeed the battleground where the ancient Nords fought Alduin and ended the Dragon War. He also reveals that the Dragonrend shout was not enough to truly defeat Alduin, in reality merely crippling him. In a final attempt to banish Alduin, the Nords were forced to use an Elder Scroll to send their foe forward in time, postponing the threat, but not ending it. The event created a rift in time itself atop the mountain, known as the Time-Wound. Paarthurnax believes that, in order to learn the Dragonrend shout, you will have to locate the Elder Scroll, then use it to open the Time-Wound and learn the shout from the ancient Nords that created it. To begin your lengthy quest for the legendary Scroll, you will need to talk to either Arngeir or Esbern. "If the world is meant to end, so be it." If you choose to question Arngeir about obtaining an Elder Scroll, you will find him inside High Hrothgar, where he will be reading, meditating, or sleeping. 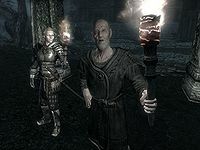 Arngeir is more skeptical than Esbern about the necessity of learning the Dragonrend shout and, when asked how one would find an Elder Scroll, he will vehemently protest: "Such blasphemies are the calling of mages, not followers of the Way. Take your question to the College of Winterhold. They may be able to help you." When asked if there is another way to defeat Alduin, he will explain his uncertainty: "Perhaps not. But this Shout was used once before, was it not? And here we are again. Have you considered that Alduin was not meant to be defeated? Those who overthrew him in ancient times only postponed the day of reckoning, they did not stop it. If the world is meant to end, so be it. Let it end and be reborn." "The whole world was in darkness." If you choose to visit Esbern, you will find him outside Sky Haven Temple, where he and Delphine can be seen staring into the horizon as Esbern recalls a strange dream he once had about Alduin. After the story, Esbern will greet you as if he only just realized your presence: "Ah, you're back. I hope you've made some progress on tracking down this Shout we need to defeat Alduin?" You can then explain that you need an Elder Scroll in order to learn Dragonrend. He will be intrigued: "Ah, indeed? There's a pretty puzzle. Not the kind of thing you'll find in your local bookshop. Let me think... Perhaps the College of Winterhold. What learning there is in Skyrim is gathered there. One of the mages there may be able to put you on the trail of this Elder Scroll." Make your way to the College of Winterhold. If you have not joined the College, you will be forced to start the initiation quest, First Lessons, to get past gatekeeper Faralda. If you are already a member, enter the College as normal and follow your map marker to the Arcanaeum. Here you will find the librarian Urag gro-Shub. After belittling you for your ignorance, he will fill you in on the potential dangers of the Scrolls: "An Elder Scroll is an instrument of immense knowledge and power. To read an Elder Scroll, a person must have the most rigorously trained mind, or else risk madness. Even so, the Divines usually take the reader's sight as a price." He will then elaborate on the incredible nature of the Elder Scrolls: "The simplest way to put it is "knowledge," but there's nothing simple about an Elder Scroll. It's a reflection of all possible futures and all possible pasts. Each reader sees different reflections through different lenses, and may come away with a very different reading. But at the same time, all of it is true. Even the falsehoods. Especially the falsehoods." You can also ask him who wrote the Elder Scrolls and he will respond: "It would take a month to explain to you how that very question doesn't even make sense. The Scrolls exist here, with us, but also beyond and beneath. Before and after. They are bits of Divine made substance so we could know them. Some people who study them devoutly go mad." Naturally, Urag does not have a Scroll lying around, and he wouldn't simply give it to you if he had. After a short discussion, Urag leaves his spot behind the counter and fetches two rare books for you, Ruminations on the Elder Scrolls and Effects of the Elder Scrolls. The first book is written by Septimus Signus and starts the concurrent quest Discerning the Transmundane when opened. 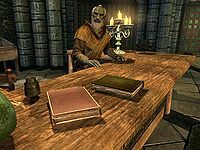 When you tell Urag that Signus's book is incomprehensible, he will explain that Septimus Signus is a specialist in Elder Scrolls lore, but he has not been back to the College for a long time. He mentions that Signus became obsessed with the Dwemer and took off north to study an old artifact. From this point, the quest Discerning the Transmundane will be part of your quest to claim the Elder Scroll. Follow your map marker to a remote ice cavern named Septimus Signus's Outpost and enter. Inside you will find Septimus Signus pacing before a huge device with a strange-looking lock, muttering to himself about the Dwemer. When questioned on the Elder Scrolls, his answer will be just as incomprehensible as his book: "Elder Scrolls. Indeed. The Empire. They absconded with them. Or so they think. The ones they saw. The ones they thought they saw. I know of one. Forgotten. Sequestered. But I cannot go to it, not poor Septimus, for I... I have arisen beyond its grasp." When you inquire as to the location of the Scroll, he will respond: "Here. Well, here as in this plane. Mundus. Tamriel. Nearby, relatively speaking. On the cosmological scale, it's all nearby." He will then agree to help you, but only if you help him, naturally. He'll point towards the Dwemer lockbox in the icy cavern and say: "You see this masterwork of the Dwemer. Deep inside their greatest knowings. Septimus is clever among men, but he is but an idiot child compared to the dullest of the Dwemer. Lucky then they left behind their own way of reading the Elder Scrolls. In the depths of Blackreach one yet lies." 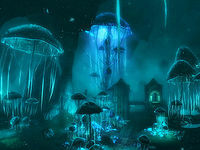 He will explain what Blackreach is and what you must go through: "Under deep. Below the dark. The hidden keep. Tower Mzark. Alftand. The point of puncture, of first entry, of the tapping. Delve to its limits, and Blackreach lies just beyond. But not all can enter there. Only Septimus knows the hidden key to loose the lock to jump beneath the deathly rock." While it is clear that Septimus doesn't care about the Elder Scroll itself, it is quite clear that he needs the information it possesses. You will have no choice but to help him. He will hand you two items, the Blank Lexicon and the Attunement Sphere. A knowledgeable person indeed, he will then provide his complex explanation on what to do with the items, including a tip that will prove valuable later. He will also provide his knowledge on what defines an Elder Scroll: "You look to your left, you see one way. You look to your right, you see another. But neither is any harder than the opposite. But the Elder Scrolls... they look left and right in the stream of time. The future and past are as one. Sometimes they even look up. What do they see then? What if they dive in? Then the madness begins." NOTE: While the map marker will point you towards Alftand, you can gain access to Blackreach from two other ruins, specifically Mzinchaleft and Raldbthar. However, if you have yet to clear either of those, the route through Alftand is recommended as your map marker will point you in the right direction. 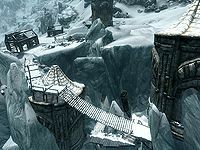 The Dwemer ruin of Alftand is located southwest of Winterhold. The exterior area contains a deserted camp, but upon investigating the ruined shack near the campsite, you will find an Expedition Manifest written by expedition leader Sulla Trebatius, hinting that you may not be alone when traversing Alftand. From the shack, head down the slope and enter the first zone, Alftand Glacial Ruins. The icy tunnel ahead contains no enemies but plenty of destroyed cooking spits, and before long you will see blood spatters all over the floor. A little further down the tunnel, you will hear the voice of one of the Khajiit members of the expedition in a Skooma-induced rant, demanding that his companion tell him where the rest of the Skooma is hidden. Head east through the tunnel and follow the path as it twists and turns. You will soon arrive in a room with a table and Calcelmo's book Dwarves, v2 along with some Research Notes from Sulla Trebatius. The door to the north is barred, so take the western path and fight the dwarven automatons that guard it. As the tunnel becomes icy again, you will encounter J'darr, mad from Skooma withdrawal, who will attack you on sight. In the corner, you will find the corpse of his brother J'zhar, lying in a pool of his own blood. Leave the bodies behind and head north until you reach a chamber with two dwarven spheres. Proceed forward. To the left, there are a set of rising and falling platforms. If you manage to get onto the tallest of the three, there will be two unlocked chests, with several potions and a jewel on a nearby surface. Then proceed through the only available path, where you will find a forge and more dwarven spiders. In this room, you can find Umana's Journal, which describes how the dangers of Alftand have claimed even more victims. 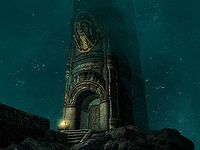 Before you open the western door, there will be a novice locked gate containing two locked chests (adept and apprentice) and various small dwemer items. After opening the western door, beware of the dwarven pressure plate in front of the chest at the top of the stairs. To the right will be another dwarven spider, easy to either kill or sneak past, and an adept locked chest. From there, head south, where another spider will be waiting. Directly past it, on your left, will be a room containing a potion of minor stamina and a potion of either vigorous or extreme healing. Even further ahead on the right is an apprentice locked door. Inside is a dwarven sphere, an unlocked chest, two beds, and various other dwarven items. Past this the hallway splits into two: on the left, a long ledge featuring dwarven spider workers and pipes that could easily push you off; to the right, a solitary spider focused on attacking the wall, and a Blacksmith's Potion. Climb across to the end of the ledge and proceed to the Alftand Animonculory. The Animonculory door opens up into another hallway. Turn left past the first gear in the wall to find an unlocked chest, a Falmer helmet and shield, a hint as to your future enemies, and assorted dwemer items. Open the door at the far end and enter the enormous chamber beyond. To your right will be a distracted Dwarven Spider Worker; if you enter the small pathway next to the stairs, you will find yet another deceased expedition member, Endrast, who is still holding his journal. On top of the journal are a lockpick and stick of charcoal, and opposite the body is an adept locked chest. Retrace your steps, climb the stairs and find the slope to the east, where a Dwarven Sphere is patrolling. There are three pressure plates here that trigger a deadly set of spinning blades. Dodge these and proceed to the level. This room is the first very large, multi-leveled chamber in Alftand. You are on the top level, so start making your way down the slopes and fight the enemies as you go. The area near the beginning, as you step down the first ramp, contains a Dwarven Spider, a potion of extreme magicka, and a novice locked chest. When you have traversed one floor, an apprentice locked door to the east leads to some worthwhile treasure. Inside is another Dwarven Spider Worker, two other gates (One unlocked and open, with an unlocked chest imside; the other with an expert lock. Inside are two chests, one unlocked, one master locked, two potions, a Dwarven Helmet, a skeleton, and a book. )You'll need to make a short jump down to proceed, where you will land near the body of Yag gra-Gortwog. To the southeast is another slope leading down, where you will find the first Falmer enemy. Stay on the path and kill any Falmer that get in your way. You will reach a platform with a door and a broken pipe spitting out fire. Open the door to leave the huge chamber for now and proceed forward towards an alchemy lab and several Falmer emerging from their tents. Dodge the flames coming from the pipes and head south until you reach a junction. The stairs to the east lead to a small room with some ingredients, while the path south will lead you to the next room. In this room, the elevator on the other side of the barred doorway leads back to the previous zone, Alftand Glacial Ruins, so at this point it is possible to return to the outside world and stock up on supplies. Otherwise, skip the elevator ride and locate Sulla Trebatius's Pack. You will also find a table holding the dead body of Valie and another with an array of rare ingredients, including a small pearl, one of only two samples in Skyrim. Find the path to the northeast and open the door. You will find yourself back in the huge central chamber, where you can continue your descent. 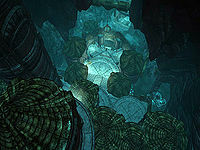 There are three Falmer and a frostbite spider at the bottom of the chamber; dispose of them and locate the door to the north and enter. The next area contains a tripwire, which triggers a claw trap. Avoid the tripwire and the trap and continue into Alftand Cathedral. Umana: "Sulla look, the passage is open, wait... there's someone down there!" Sulla: "No! Blackreach was to be my discovery!" Umana: "Sulla, let's just get out of here. Hasn't there been enough death?" Sulla: "Oh, of course you want me to leave. Just waiting for me to turn my back. So you can have all the glory for yourself!" Sulla and Umana will then proceed to fight each other; keep your distance until one is victorious (usually Umana). The other will then turn against you. Dispose of them and investigate Umana's body for the unique shield Targe of the Blooded. Turn your attention towards the Dwarven Mechanism in the center of the room. Activate it, and the Attunement Sphere will do the rest, revealing a staircase leading downward. You can return to the outside world from here by using your newly acquired key on the gate to the southwest. This will also provide a useful shortcut for later visits (make sure to open the gate at the top of the elevator). From here, head down the stairs and prepare yourself for Blackreach. Finally, you will be in Blackreach, a vast, beautiful, eerie, and dangerous underground cavern that will take time to traverse completely. Dwarven automatons and Falmer continue to be common enemies, and you may encounter chaurus and giants as well. 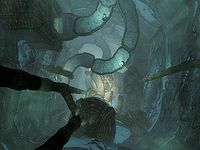 Blackreach can be overwhelming and quite difficult to navigate, especially since your in-game map will only ever allow you to see a portion of the cavern. Additionally, it is loaded with distractions, so stay on the path for now and keep your eye on the prize: the Elder Scroll. The fastest route from Alftand to the Tower of Mzark is the road to the left, immediately out of the Alftand Cathedral. Continue along the road in a southeastern direction and fight a dwarven sphere and a Falmer. When you come to the first junction, make a right and head southwest along that road and fight more chaurus and another Falmer. As you travel underneath a bridge, a Falmer will shoot arrows at you from above, but just move forward and stay on the path. Fight two chaurus and continue on until the path turns in a western direction, across a bridge. When you cross the bridge, the Tower of Mzark will be visible to the southwest, and the trail will lead you right to the entrance. 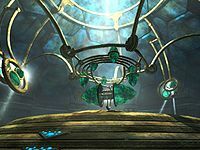 Once you have entered the Tower of Mzark, investigate the first room for some minor loot, then go through the door and behold a Dwemer contraption that would make even Septimus Signus proud: a giant sphere with various lenses fills the entire first floor of the room. The second floor sits on the upper part of the sphere and, hanging from the ceiling, a series of lenses conceal a container. If you investigate the surrounding area, you will find the skeletal remains of Drokt. His journal will inform you how he became obsessed with the Oculory, and he seemingly died without managing to align it correctly. The journal also contains a tip on how to solve the puzzle: "The light through the knowledge through the machine rests on the cube." This echoes the words of Septimus Signus: "The Dwemer found a loophole, as they always do. To focus the knowledge away and inside without harm. Place the lexicon into their contraption and focus the knowings into it." With these two tips in mind, head up the last slope, where you will find four buttons and a Lexicon Receptacle. Place the Blank Lexicon in the receptacle and watch the ceiling of the room open, shining light onto the container beneath. This also activates the two buttons on the right. To focus the lenses on the floor, place yourself so you can see the Lexicon and the central floor. Activate the button on the second pedestal from the right four times in a row and the Lexicon will open. This also activates one of the buttons to the left. Press it twice and the lenses in the ceiling will change position, allowing the light shining through the container to hit the corresponding lenses on the floor, thus filling the Lexicon with knowledge. The last button to the left will now be active, so push it once and the upper lenses will move aside, making room for the container to be lowered down from the ceiling. Once it has reached the floor, it will open and reveal the legendary Elder Scroll, the very source of the elder knowledge, yours for the taking. Remember to pick up the inscribed Runed Lexicon from the receptacle, then claim the Elder Scroll. This ends the quest and starts the next one, Alduin's Bane. 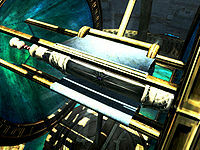 Attempting to read the Elder Scroll will inflict temporary blindness upon you. Having the Clairvoyance spell can be very helpful for navigating Blackreach. 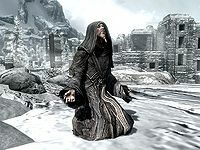 If you have already spoken to Urag gro-Shub, you will have an option to tell Paarthurnax that the "Lorekeeper" of the College of Winterhold can point you in the direction of the Scroll. If you have already obtained the Elder Scroll during Discerning the Transmundane, as soon as The Throat of the World is completed, this quest will be automatically completed as well and Alduin's Bane will begin. This will skip some of Paarthurnax's optional dialogue. This quest occasionally conflicts with the College of Winterhold quest line. For example, if you are doing the quest Containment, Urag gro-Shub will simply say, "we should never have brought that thing here" (referring to the Eye of Magnus). Urag gro-Shub will sometimes lack the dialogue options required to continue Elder Knowledge. At other times he may not even talk to you, or not place all the books on the desk. This can be resolved by either going directly to Septimus Signus and speaking with him, or by finishing the College of Winterhold quests. Alternatively, PC users can use the console to progress by advancing to stage 80 (setstage MQ205 80). If you leave the Tower of Mzark without collecting the Elder Scroll and complete Discerning the Transmundane, collecting the scroll later will have no effect and this quest will be blocked. 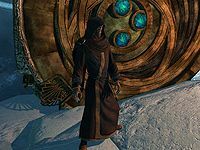 Mod Notes: Once Discerning the Transmundane is complete, the reference to "ElderScroll" in DA04ElderScrollActivatorScript is no longer valid, breaking the script. If this happens, the Scroll will not appear in your inventory after collection. This can be resolved by collecting the Scroll and then spawning it in your inventory with player.additem 2d513 1. You should be able to read the Scroll after using this console code. The optional quest objective to talk to Esbern may not be listed in your journal. 10 I met the master of the Greybeards, the dragon Paarthurnax. He told me that the ancient Nords used an Elder Scroll to cast Alduin forward in time. If I can recover that same Elder Scroll, I may be able to use it to learn the "Dragonrend" Shout directly from the ancient heroes. 50 I met the master of the Greybeards, the dragon Paarthurnax. He told me that the ancient Nords used an Elder Scroll to cast Alduin forward in time. If I can recover that same Elder Scroll, I may be able to use it to learn the "Dragonrend" Shout directly from the ancient heroes. Esbern suggested that someone at the College of Winterhold might know how to find this Elder Scroll. I met the master of the Greybeards, the dragon Paarthurnax. He told me that the ancient Nords used an Elder Scroll to cast Alduin forward in time. If I can recover that same Elder Scroll, I may be able to use it to learn the "Dragonrend" Shout directly from the ancient heroes. Arngeir suggested that someone at the College of Winterhold might know how to find this Elder Scroll. 60 I met the master of the Greybeards, the dragon Paarthurnax. He told me that the ancient Nords used an Elder Scroll to cast Alduin forward in time. If I can recover that same Elder Scroll, I may be able to use it to learn the "Dragonrend" Shout directly from the ancient heroes. I've learned that a scholar named Septimus Signus might know where to find it. 100 Finishes quest I met the master of the Greybeards, the dragon Paarthurnax. He told me that the ancient Nords used an Elder Scroll to cast Alduin forward in time. Now that I've recovered that Elder Scroll, I may be able to use it to learn the "Dragonrend" Shout directly from the ancient heroes. The following empty quest stages were omitted from the table: 0, 1, 40, 45. On the PC, it is possible to use the console to advance through the quest by entering setstage MQ205 stage, where stage is the number of the stage you wish to complete. It is not possible to un-complete (i.e. go back) quest stages, but it is possible to clear all stages of the quest using resetquest MQ205. This page was last modified on 11 April 2018, at 17:53.